I always wanted to write for a living. When I told my secondary school English teacher this towards the end of my A-Levels, she pointed me towards a degree in journalism. Soon after, I followed her suggested career route, joining the Journalism class of 2001 at Dublin City University. I’ve never really looked back. Until now. Post-graduation in 2005, I spent a hectic year living in Dublin juggling three jobs; something had to pay the bills while I searched for that much-lauded and increasingly elusive paid writing job. My search eventually ended in spring 2006, when I was offered a job with a large independent magazine publishing company in Belfast. I upped sticks and moved to a city I’d only visited once – a risky move at the time. Seven years on, I’m still here. 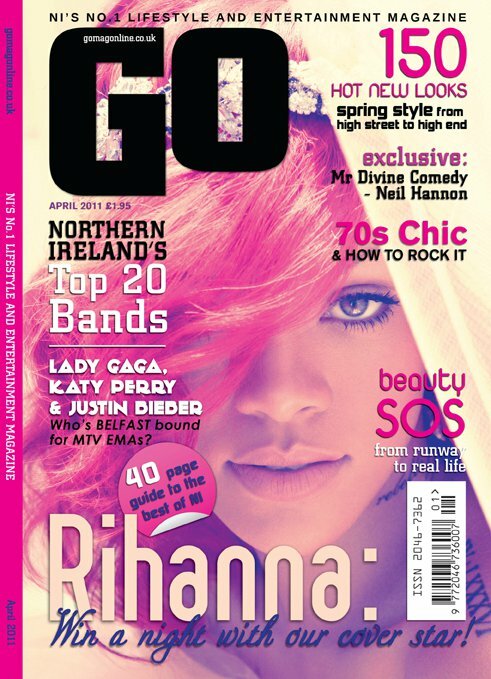 I was taken on for the launch of the company’s new launch title, GO Belfast (now GO Magazine) – a lifestyle and entertainment magazine for men and women. The title’s launch was a reaction to a new Belfast that was emerging at that time; a thriving, contemporary city with a blossoming social and creative scene. I quickly rose up the ranks from an editorial assistant to reporter, deputy editor and then editor. All in all I spent five and a half years with the title, prior to moving into PR in July 2011. My writing for GO was varied; I wrote on everything from fashion and food to music, arts, culture, film, current affairs and more. I also had the pleasure [and displeasure at times] of interviewing countless celebrities and stars; getting a relished glimpse into the lives of the rich and famous. Undoubtedly one of my biggest musical crushes, Debbie Harry is a living legend. I am a massive Blondie fan, so when I heard they were coming to Belfast for a show, I made it my mission to secure an interview with Ms Harry. It was a slightly strange interview, to say the least. My questions were relayed first by email to her publicist, who then read them to Debbie via video link before transcribing them and sending them back to me. It was a strange set-up, however, I’m still glad to say that I was able to interview a true music icon. Read the full story here. 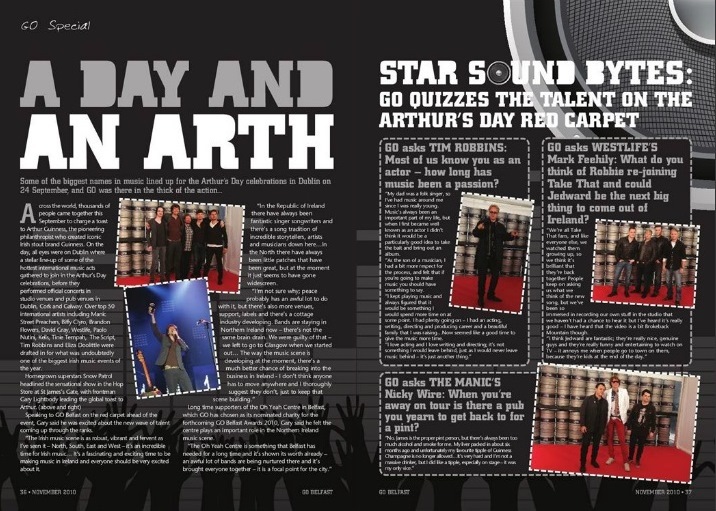 One of the perks of the job was getting to go to great events and one such event was Arthur’s Day in 2010. A very clever marketing construct by drinks company, Diageo for its flagship brand, Guinness, this was the second annual Arthur’s Day celebration and I got to spend it in the Guinness Storehouse in Dublin. I joined media from across Ireland and further afield to interview stars including Snow Patrol, Manic Street Preachers, The Script, Kelis, Westlife, Tim Robbins & Eliza Doolittle on the red carpet. Some Guinness was also consumed. Read the full story here. As a seemingly simple Q&A, this isn’t exactly a work of art writing wise. I’ve included it here however, as it was possibly one of the most bizarre interviews of my career. Fictitious TV personality and Celebrity Juice star, Keith Lemon (brainchild of comedian/actor, Leigh Francis) stayed in character for the entire interview; serenading me over the phone at the beginning and proving impossible to keep on track throughout the rest of it. I’ve kept the recording of the interview for safe keeping too – when you listen to it, the interview is peppered with uncontrollable spurts of involuntary laughter on my part. I’ll save you that particular horror. You can however, read the full interview here. 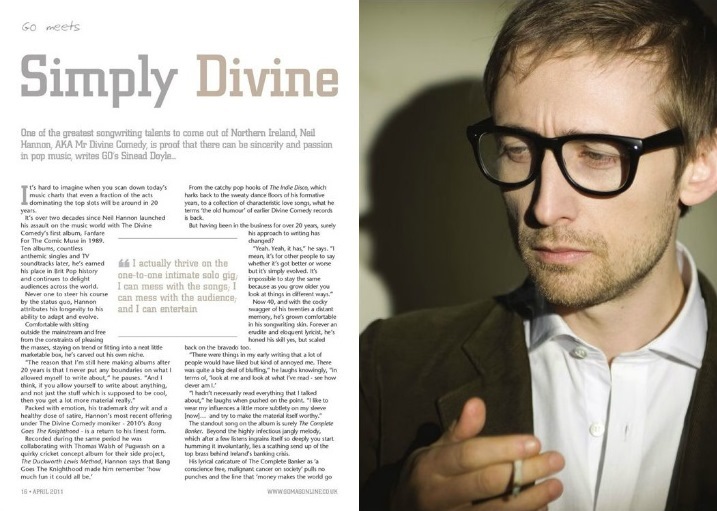 An interview with one of my musical heroes – The Divine Comedy frontman, Neil Hannon. A true lyricist, I’ve always admired his beautiful and distinct way with words. Perhaps one of the most captivating interviewees, I’ve had the pleasure of speaking to, his love and passion for his work was inspiring. Read the full story here. 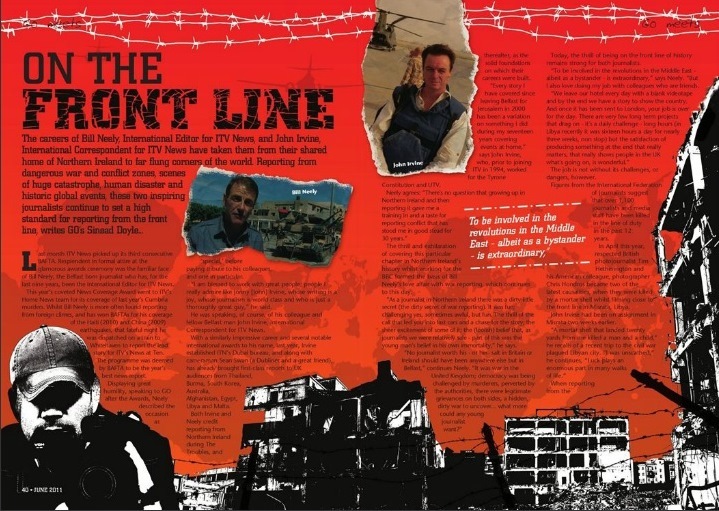 A profile piece on two of Northern Ireland’s leading war correspondents, Bill Neely and John Irvine, featuring interviews with both journalists – two men I greatly admired.